Money in the Garage: Happy Fourth! It's the Fourth of July weekend and what better way to celebrate America's birthday then a great eBay flip with a patriotic red, white and blue theme? Check out this lot of vintage Uncle Sam cake decorating picks. These would have been placed on holiday party foods such as cakes, fruit salads, appetizers and burgers. I bought the entire box of these guys for only three dollars. A pretty cool find considering it's almost impossible to find decorative picks like these anymore! 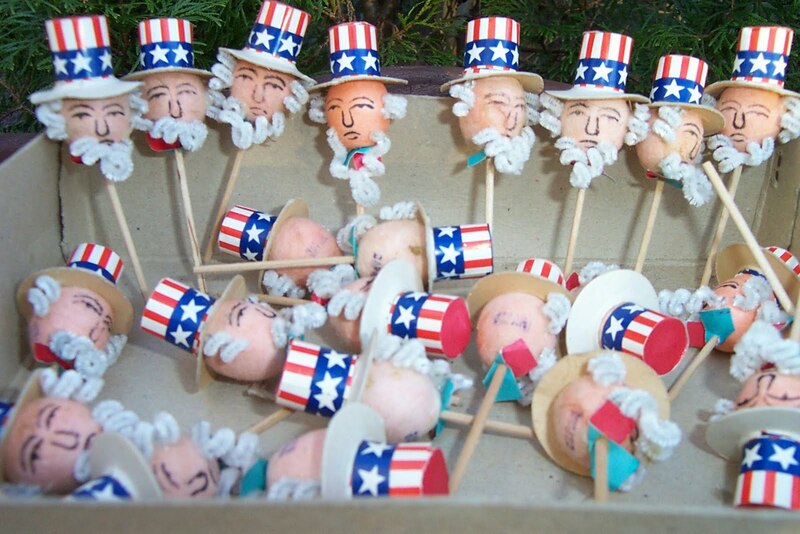 These little Uncle Sam's had cardboard top hats and pipe cleaner beards. Ironically, each Sam was stamped "Japan" on the back. Yet another product cranked out in post-World War II Japan that people now find collectible. When you're at garage sales look out for small decorative items stamped "Japan". There's a very good chance it will earn you decent dollars on eBay or Etsy. While a post-war Japan collectible is good, adding a patriotic theme to it is even better. For example, my Aunt Joan loves to collect anything, red, white and blue. At barely five foot tall, she's just a little thing but around the Fourth she gets all gussied up in the spirit of the holiday. Sporting an American flag shirt, flag hair clip, patriotic earrings...she looks like a walking fireworks display! Using personal experiences as a guide, I figured there were plenty more people like my Aunt who love to collect patriotic themed stuff. My Uncle Sam picks would be attracting both bidders who collect vintage Americana stuff and post-war Japan. Kind of a weird dichotomy, but still a nice variety of potential bidders. So the Uncle Sam picks hit eBay and by the end of the auction fireworks were going off in my head! My three dollar investment in those little Uncle Sam picks sold for $44 All-American dollars! Three cheers for the red, white and blue! Do you have any patriotic themed flips? C'mon and share with the group in our comment section! Happy Fourth of July ! Australia here - so no 4th of July Holiday. However it's my birthday on that day, so I certainly will have a Happy 4th as i take myself out to dinner. Unfortunately I'm sure there wont be any of those cute vintage picks you scored. Today is Territory Day and everyone is letting off firecrackers and fireworks in their backyards. Patriotic waste of money as they cost HEAPS. I'm loving your blog! Can't wait to read more of your posts--we have a great deal in common! See what I like to sell at www.yardsalemommy.blogspot.com. Happy fourth! Frugal-Happy B-day on he fourth, you're a Yankee Doodle Aussie! Territory Day sounds like some fun too! Jen-Thanks for checking in! I am Glad you're enjoying the blog. As they say about the big city, "there's a million stories out there". I'll definitely follow your blog too, it's right up my alley! Hey Dude! If you get a minute, email me at yardsalemommy@gmail.com...I have a question (or idea) for you! Hello from North Eastern Kentucky. blogs that share my passion for treasure hunting. Hi Kym- Thanks for the thumbs up, I really appreciate it! I'm gonna head over to your blog right now, love the name...funny stuff! Dude@MoneyintheGarage.